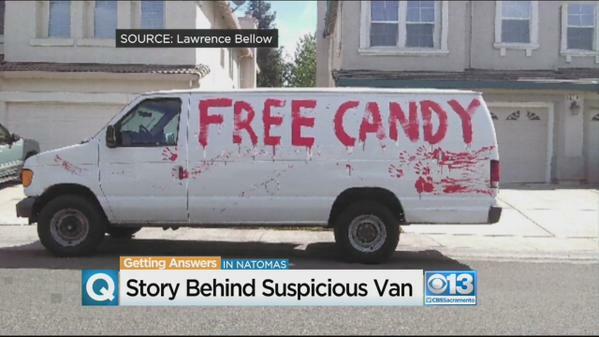 To a parent, there’s nothing scarier than the idea of a kidnapper luring their kids into a strange van under the pretense of giving out free candy. Children learn from an early age not to take candy from strangers, but even the smartest children are vulnerable to the threat. 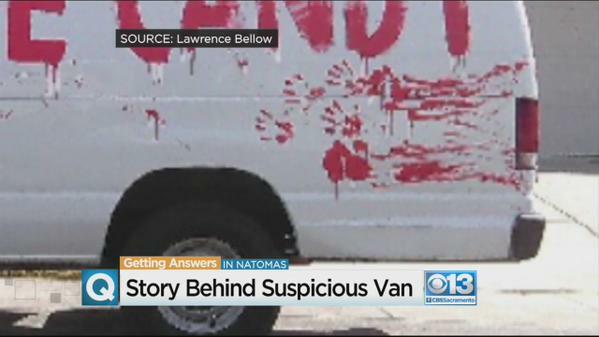 So when a suspicious van appeared in the community of Natomas in Sacramento, it’s no surprise that police were alerted immediately. The white van had “FREE CANDY” emblazoned on the side in red paint, as well as what appeared to be hand prints trailing along the side. The van also had blacked-out windows and no license plate. Luckily, nothing did happen, and the van turned out to be a joke. It belonged to local resident Sierra Deblonk’s family friend, who was on his way to Nevada’s Burning Man festival. Interestingly, no one who knew about the van thought it would be the cause of so much panic. “It’s nice to know that if was there actually a creepy white van around that people would be taking notice of that,” Sierra commented.